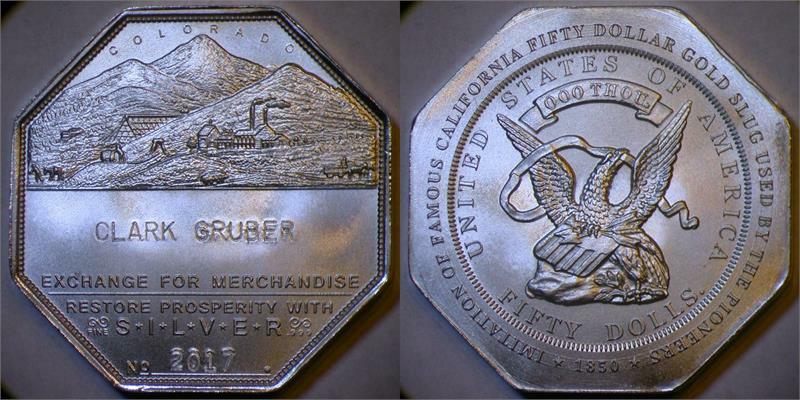 Home > Alternate Currencies > 2017 Lesher Dollar Token, Octagon, Silver, Assay Office reverse, "CLARK GRUBER" imprint, with "2017" date imprint. Silver advocate Joseph Lesher produced $1 and $1.25 silver tokens in 1900 and 1901 in Victor Colorado. Many were imprinted for various merchants who would accept them in exchange for merchandise. They circulated in Colorado and some surrounding states. Today they are sought-after rarities. This modern Lesher token is a high-quality and faithful tribute to the originals. This particular product comes with "CLARK GRUBER" and "2017" date imprints. It features an alternate reverse with a traditional US Assay Office design. A Great 2017 Lesher Dollar ! Another exceptional creation and I think the best Lesher design so far due to the Assay Office reverse. Great work Dan !